I refuse to think about Christmas or Hanukkah until this week in order to give Thanksgiving its full due. But now that the turkey has been turned into casseroles, sandwiches and soup, I can begin to think about the next holiday. I know it sounds weird, but I love the chaos of this season. By the end of the month, I’ll be ready for the calm of my everyday life to return, but for now, I’m relishing the approaching decorating, cooking, and even shopping. As you make your list of gifts to buy for others, consider adding one of these to your list to buy for yourself. Or, they could be the perfect stocking stuffer for your hubby to buy for you or you to buy for him. Or, if you have an overabundance of moxie, you could ask your mother-in-law for the second one. When the package arrived at my office with Mamalita, my first reaction was to sigh. I read every book written by every guest on our show, so to say that I wasn’t enthusiastic about the arrival of a book that I didn’t request and didn’t have to read was an understatement. My second reaction was to put it in the ever growing stack of things I should do, but know that I never will. The problem is that having written a book myself, I know first hand that giddy excitement when your book is first published… that almost overwhelming desire for someone—anyone really—to read it. Every time I saw the beguiling cover of Mamalita peeking out of my “Will Never Get To In a Million Years” stack, I felt guilty. At bedtime one night I realized that I had nothing to read and remembered Mamalita poking and prodding my conscience in my office. I don’t like reading work related books at bedtime, and an adoption memoir felt way too much like work, but having nothing else to read and being tired of feeling guilty, I caved. Boy, am I glad I did. Mamalita is a joy. Although it is the story of a Guatemalan adoption, its appeal is universal to all adoptive parents—especially those who adopt internationally. First and foremost, O’Dwyer is a gifted writer. A story whose conflict is primarily bureaucratic has the potential to be dull, but O’Dwyer artfully manages to make the book actually suspenseful, even though you know going in that ultimately she prevails. I was hooked from the beginning. I liked this book because it was well written and “a good read”, but I loved this book because of the way O’Dwyer handled the ethics of international adoption. It is tempting as an adoptive parent to become defensive, to gloss over the ethical dilemmas inherent when wealthy people from developed countries adopt babies from poor people in undeveloped countries. It is equally tempting for “reformers” to over simplify the ethics and the solutions. The reality is that often international adoptions are a blur where the white and black hats are not at all clear. O’Dwyer captures the gray with a refreshing lack of defensiveness or editorializing, allowing us to ponder what we would do if faced with the same situation. This book is well worth the read. For better or worse, women are usually the gatherers of information when it comes to the disease of infertility. Look around any support groups or forum– the faces and names are mostly female. The same is true for our Creating a Family audience, Facebook and Twitter social networking community, and Facebook support group. Even though we welcome the guys, they don’t show up. The problem with this imbalance, in addition to the burden it places on the ladies, is that both women and men are affected by infertility. The truth is that there is a dearth of resources specifically geared to men. 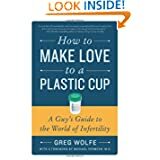 That problem has now been solved by a terrific book, with an even more terrific title: How to Make Love to a Plastic Cup: A Guy’s Guide to the World of Infertility by Greg Wolfe. First and foremost, this is a very good book about the biology and medicine of infertility. Anyone, male or female, could learn a thing or two, but this book is specifically written by a guy for guys from a guy’s perspective. Although Wolfe has male infertility and does a great job of explaining the physical and emotional aspects of male factor, the book is for any man who is part of an infertile couple, regardless of the cause. Wolfe tackles infertility from soup to nuts. (OK, you can’t expect me to pass up the opportunity for that pun, can you?) He covers the biology, of course, but goes way beyond to the nitty gritty of infertility as seen and felt by a man–what it’s like giving your wife a shot, talking about infertility (or not) with your friends, and living with a hormone charged women in quest of a baby. His chapter on giving a sperm sample is worth the price of the book. My husband and I both laughed until we cried, and therein lies the genius of this book. By allowing us to laugh at the embarrassing, humiliating, and emotionally draining aspects of infertility, we feel less alone. This book should be a must read for every man who is affected by infertility. By the way, I interviewed Greg for a recent Creating a Family show. 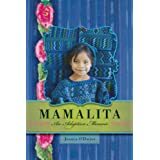 I wholeheartedly agree about “Mamalita.” Even though I’m not personally connected to Guatemalan adoption, I found the book hard to put down. Must also check out the Paper Cup book. Thanks for your insightful reviews! And we will soon have Lori’s new book The Open-Hearted Way to Open Adoption to add to the list of great adoption books. Can’t wait to read it. I love your reviews. I’ve added both books to my Amazon wish list. Probably will get them both for Christmas since I share that list with my family. I loved the book How to Make Love to a Plastic Cup. Some parts made me laugh so hard that I cried. Although it is written for men…as a woman I thought it was very informative. In fact, it is one of the most easy to understand infertility books that I have read.